Donald Trump's grandfather almost changed the course of history when he begged to stay in Germany as he unsuccessfully fought his expulsion from the country for failing to perform mandatory military service, a letter has shown. 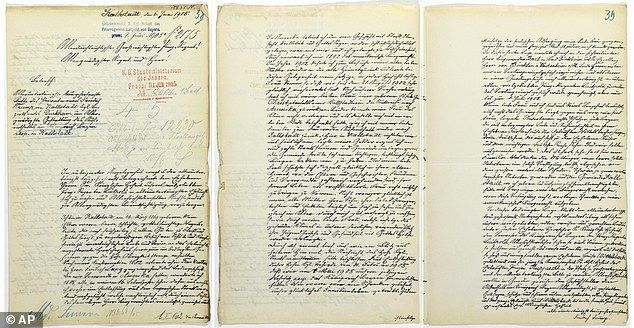 The handwritten missive, found in a German archive by an historian and published Monday by Bild newspaper, dates back to 1905. Friedrich Trump begged Bavarian Prince Luitpold, whom he called a 'well-loved, noble, wise and just' leader not to deport him. Luitpold however rejected the 'most subservient request' and the elder Trump was sent back to the United States. The move, two generations later, earned Donald Trump natural-born citizenship - without which he would never have been able to run for president. Trump's grandfather was born in Kallstadt, then part of Bavaria, and immigrated to the US as a teenager without performing his military service. He tried to resettle in Germany after making his fortune there but was ordered expelled, and returned to the US. The archive also contains Friedrich's birth certificate, Rhineland-Palatinate state archive spokeswoman Isabell Weisbrod said. Like his grandfather, the president-elect didn't serve in the military, taking five draft deferments during the Vietnam War. One of them, obtained after he graduated college, was a medical deferment due to a diagnosis of bone spurs in his heels. The other four deferments were for his education. His grandfather, born Friedrich Drumpf, built up the family's fortune after moving to New York City in 1885 aged 16. He joined his sister, who also lived in the city and worked as a barber for six years after a German-speaking man took him on as an apprentice. Friedrich then moved to the North West and Canada before heading to Seattle, Washington aged 22. There, he opened a restaurant and bought a property near Monte Cristo, Washington, using some of his mother's money. He opened more restaurants at 27 years old, including the New Arctic Restaurant and Hotel and the White Horse. According to Gwenda Blair's 'The Trumps: Three Generations of Builders and a Presidential Candidate', Trump's hotel had prostitutes as well served round-the-clock food and liquor. Donald Trump has denied these claims, telling the New York Times they were 'totally false' - even though he has never met his grandfather. 'Customers depended on him for food, liquor and women,' Blair, wrote in the book - describing Friedrich as 'hard living and hard drinking'. 'In the larder was salmon and an extraordinary variety of meats, including duck, ptarmigan, grouse, goose, and swan, as well as caribou, moose, goat, sheep, rabbit, and squirrel,' Blair wrote in the book. Friedrich Trump later sailed to the Yukon River on a schooner, but got stuck along with other prospectors in the Gulf Of Alaska. He went back to Germany in 1902 and got married with his former neighbor Elizabeth Christ before returning to the US, the New York Times reported. His wife however became homesick and the pair returned to Germany in 1904, the year before Friedrich's failed attempt to settle back in his native country. When German authorities interpreted his move to the US as a move to avoid military service, Friedrich told them: 'It was my intention to remain in America forever', Blair wrote in her book. 'We are loyal Germans and stand behind the high kaiser and the mighty German Reich', Friedrich said according to Blair. 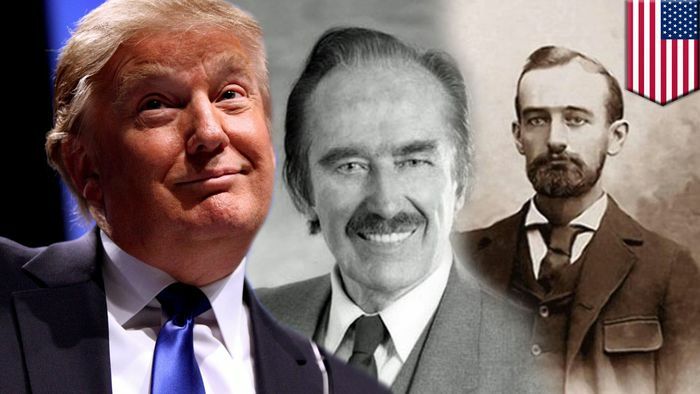 The couple returned to the US in 1905, while Elizabeth was pregnant with Donald's father, Frederick Christ Trump. Friedrich tried one last time to return to Germany before settling in Queens. He died in 1918. The Trump family hid its family origins after World War II and told those who asked that they were Swedish, Trump's cousin John Walter, the family historian, told the New York Times . The president-elect himself later questioned the need for such a ruse, asking his father in the mid-1980s: 'Do I have to do this Swedish thing?' according to Walter. Donald Trump's mother, Mary Anne Trump, emigrated to the United States from the Isle of Lewis, in Scotland, aged 18.